While we were away in Paris earlier in the month Stéphane took the opportunity to finish some rather messy and time consuming work. In total, it hardly amounted to more than 1m², but it was several days of work involving dust and debris, then bucketloads of chaux, red sand and water. 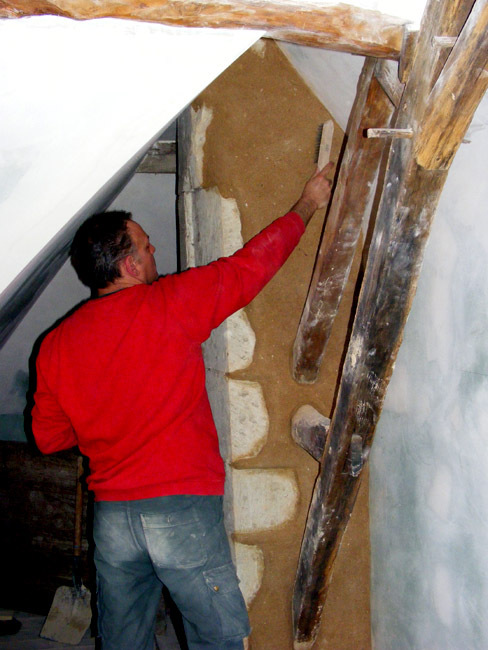 The stone wall around the door of the attic bathroom has not been lined, but left exposed so that it could be finished in a more traditional manner and join the impressive carpentry in adding a bit of character to the otherwise modern dead flat plasterboard lined room. 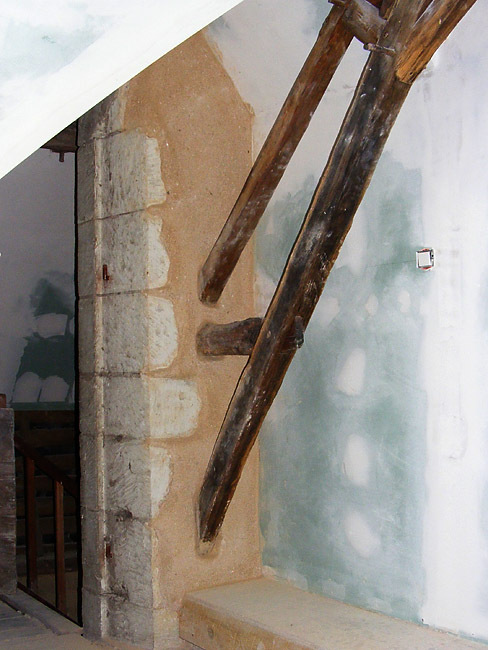 To make the stone presentable it had to have all its crumbling old mortar and plaster scraped out. Then the moellons (rubble stones) had to be damped down for several days in preparation to being coated with a thick layer of chaux (lime) mixed with red sand to give it the traditional pale terracotta colour. The pierres taillées (cut stones) which form the doorway itself were to be left exposed. 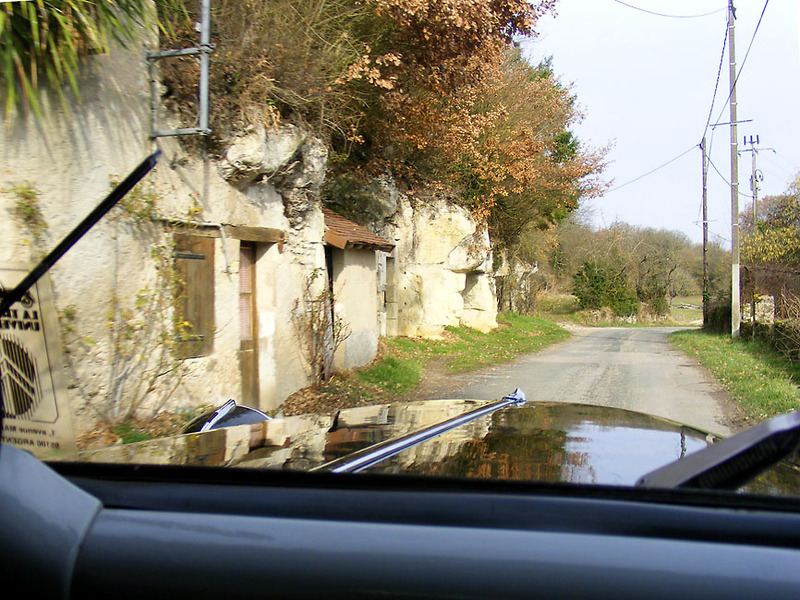 Walls like this are very common in the Touraine. The moellons were cheap to produce and easy to handle, and could easily be covered in render if a neater finish was required. Big, heavy, expensive cut stone was only used around openings and on facades. the morning just before leaving for Paris. 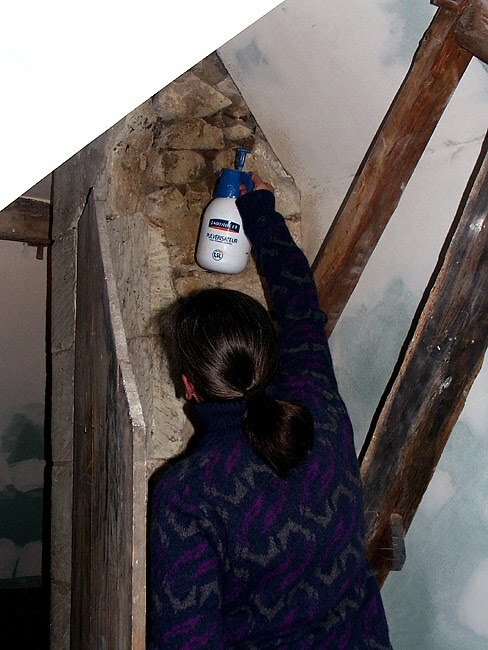 Stéphane applying the final touches to the day old render (below). He's using a stiff wire brush on partially dry render to simultaneously smooth and ensure an even texture. Stéphane has a real eye for line and contour. This recipe is for all those people, like me, who are operating out of a temporary kitchen, with only a mini oven and no flan tins. It's a simple lunch using supermarket ready prepared ingredients that takes about 20 minutes to prepare, 45 minutes to cook and serves 2-5. Cut the carrots in half lengthways and slice into half rounds. Cut the zucchini into matchsticks. Heat the oil in a pan and sweat the vegetables for 15 minutes, seasoning them with the herbes de Provence, salt and pepper, and stirring often. 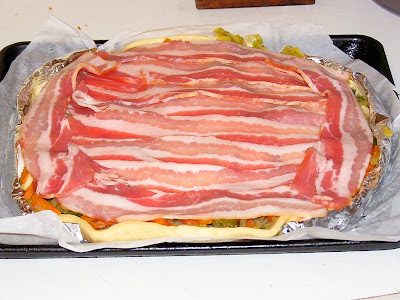 Lay the pizza dough on a lined oven tray. Make folded foil supports for the edges of the dough and gently raise the sides so that the filling won't run out. It doesn't need to be as high as a flan. 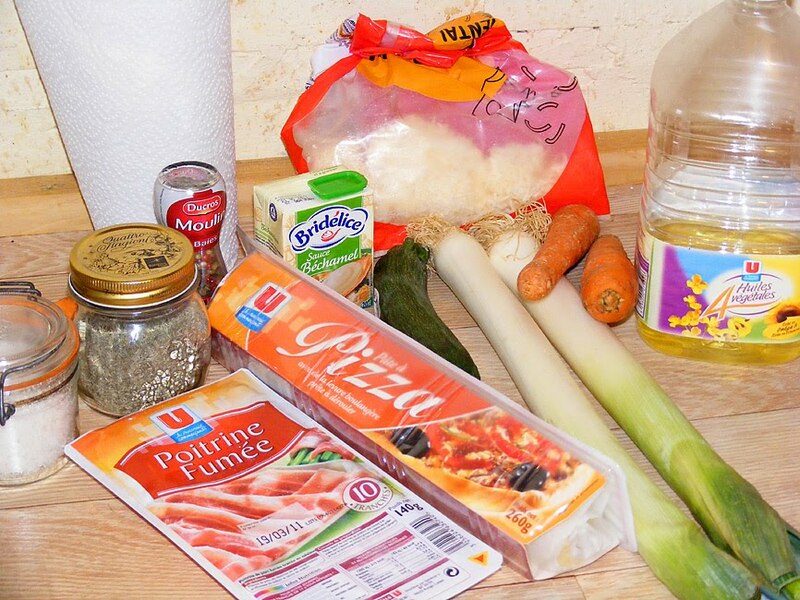 Spread the vegetables over the dough. Dollop on the béchamel so it is evenly distributed. 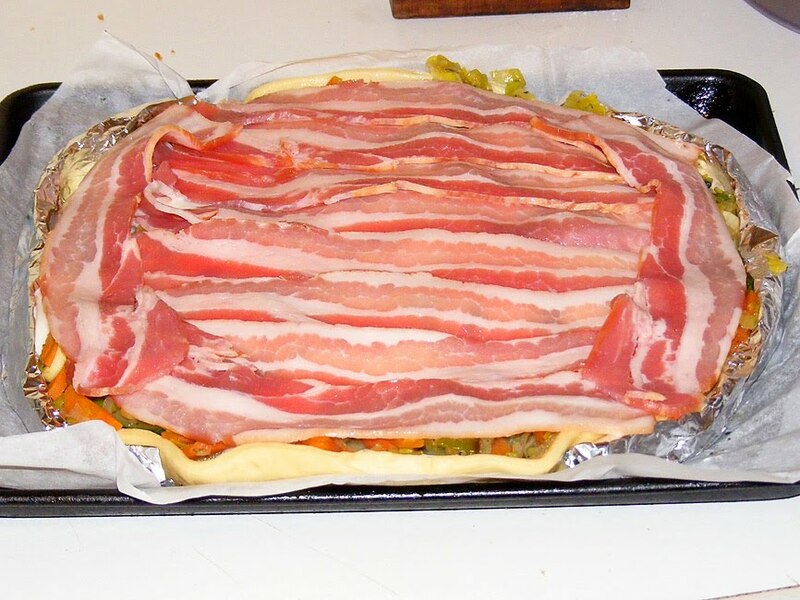 Cover with the bacon rashers. Sprinkle with grated cheese and put under the grill for 5 minutes. 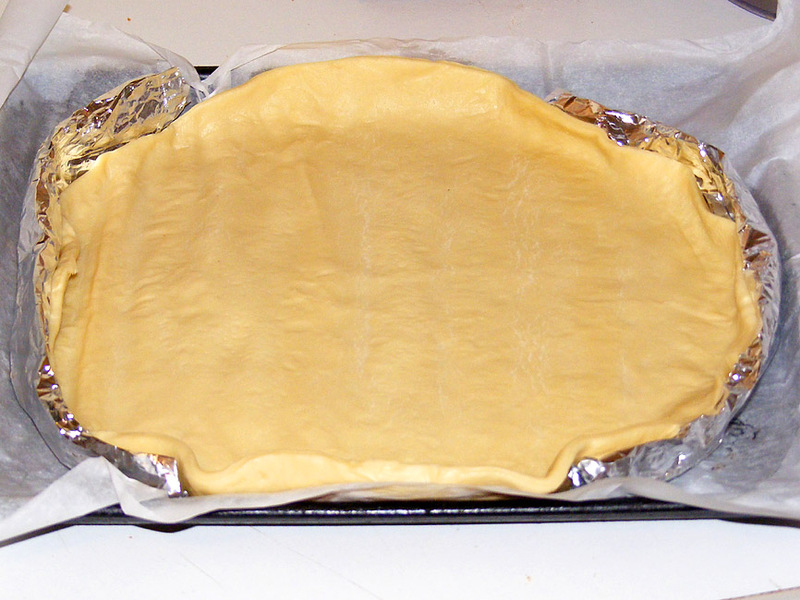 The dough, with raised edges supported by foil. Covered in fines tranches de lard and ready to go into the oven. *Many thanks to Françoise for giving us a jar of her parents' home made herbes de Provence. Things have been quiet here this last week. The first few days of this week my eyes have been so puffy they have been almost closed, red raw, itchy and uncomfortable enough to stop me sleeping. The itchiness has spread to my neck, arms and hands, and lower leg. I went to the pharmacie in la Roche Posay, and bought some creams off the skin care specialists, but they only aggravated the issue. The antihistamine tablets they also provided made no noticeable difference, except I got all the side effects. We went to our own pharmacie on Thursday and bought some new you beaut eyedrops for "allergic conjunctivitis" which have bought some relief, even if they do sting like crazy when they go in. Hopefully, this is the start of recovery, and next week we can get on with stuff. 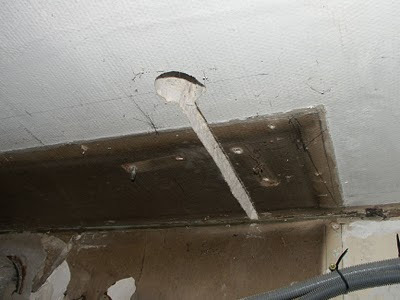 The other thing you aren't going to see is photos of us cleaning out the blocked sewage pipe at the front of the house. Disgusting doesn't cover it. So there you go - the sort of week which makes all other weeks feel good. When we visit Paris we always stay at the same hotel - le Laumiere in the 19th. This gives us an opportunity to buy shoes, something I find very difficult in this region. Having proper bloke sized feet I am too big for the delicate little things available in the shops around here. 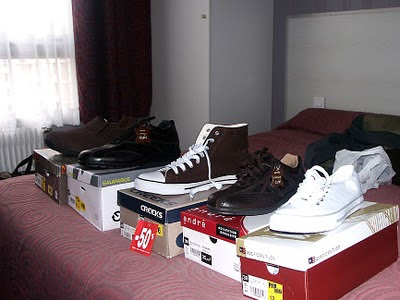 Usually the biggest size I can get here is a 45 (10½ UK or 11 US), whereas my feet are a wideish 47 (12 UK or 12½ US). Luckily, just around the corner is Halles aux Chaussures, where we normally manage to buy a year's supply of shoes at good prices. 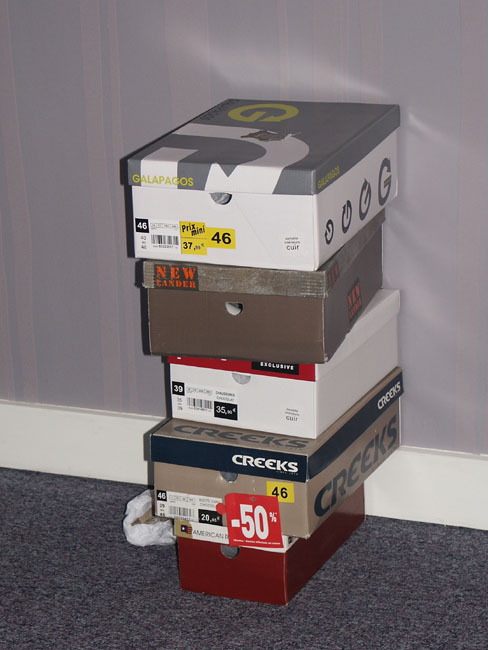 This means that for the past two years I am sure the cleaners have been bemused by what we leave behind: a pile of shoe boxes to be recycled. As you can see by the boxes, many of the shoes are at reduced prices, so Susan always manages to squeeze in the purchase of a pair or two of shoes, even though she doesn't have the same issue with size as I do. When we were in Paris at the beginning of the month we had (as is now custom) a walk through the Parc des Buttes Chaumont. It is one of our favorite places in Paris, much loved and heavily used by local residents, but often neglected by tourists. As it is only a two minute walk from our hotel it makes for a really handy place to go for a pre-breakfast (if there is such a time) or mid afternoon walk. The park is in what the English would regard as the Victorian tradition of public spaces, but unlike the parks in London it has a vertical as well as a horizontal dimension. The park has rolling hills and the lake is at the bottom of a huge pit, with which I managed to amaze Susan with how much I knew about the park's history: telling her that was the original Plaster of Paris mine. 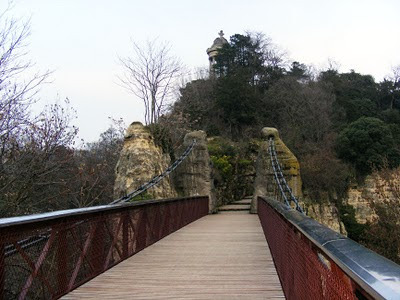 The last couple of years the suspension bridge and building at the end of it have been under repair, so we were pleased to see that by the beginning of 2010 the bridge had reopened, and that this year the building at the "mainland" end of it is now the Pavillon du Lac cafe/restaurant. If you are in that part of Paris we cannot recommend the park highly enough. It is a pleasant place to be in most weather (rain could try the relationship) and if you're with children they will just love chasing around the streams and caves. There is a photo of the lake in spring here. I was really pleased a few days ago to see numerous colonies of Glanville Fritillary Melitaea cinxia caterpillars, venturing out from their cobweb nests to munch on the plantain Plantago in the orchard. I saw colonies at the end of autumn, but with the bad weather in December they seemed to disappear. It's good to see they have managed to overwinter after all. These first generation caterpillars go for the plantain, but later in the year I find the caterpillars more on Speedwell Veronica. 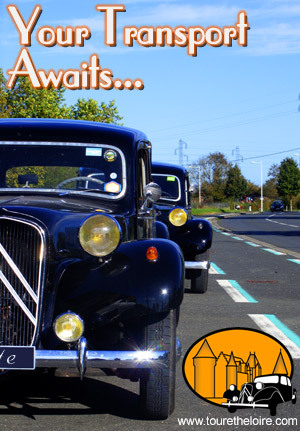 We have written before about catching the bus to Tours. This is an amazingly simple and cheap way to travel: the just under two hour long trip costs €1.70, and the bus leaves Preuilly at 7.00am, 10.10am and a couple of times in the afternoon that don't affect us (full timetable here). 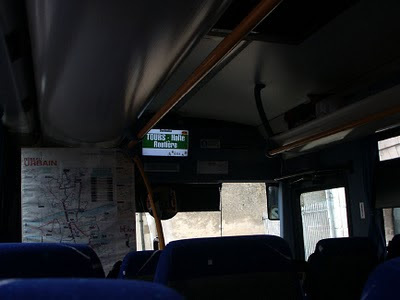 One improvement in the bus we noticed this time is the new laser display screen (actually, digital display, but I'm sorry, I haven't a clue about these things) which gives all sorts of information for travellers. These make the bus even easier to use for people who only travel by bus occasionally or who are visitors to the area. There is nothing worse than catching a bus to somewhere you don't know, because you worry about missing your stop so much you usually get off the bus two stops early. At least - that's what Susan and I agreed we usually do. You may not be surprised to hear that yesterday we found a stone - after all, we live in a stone house. This stone, however, is different: it is apparently suspended in the false ceiling of the kitchen. No, me neither, although I assume it used to be a hearth stone for upstairs, and that it stays there by being cantilevered into the wall. The 12th Saffron Fair perpetuates a rediscovered tradition. What can be done with a gramme! It's a little blue flower that everyone wants. To net a gramme of saffron you need a hundred flowers minimum. So it's easy to understand the hope and despair of producers when they ponder the crop, before harvesting the precious stigmae. It's nicknamed 'red gold' for its rarity and its colour, obviously, but also for its unmistakable taste, which is a feast for the tastebuds. 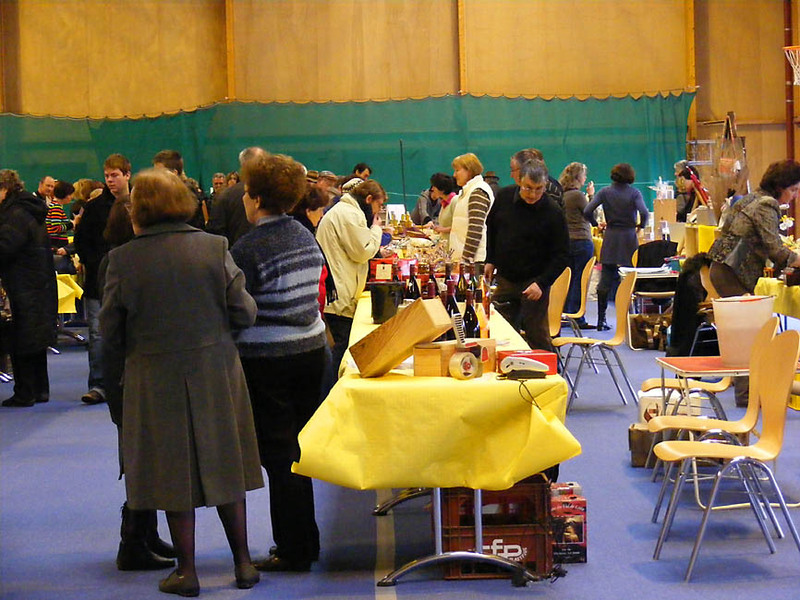 the salle des fêtes, and this year was held in the gymnasium. 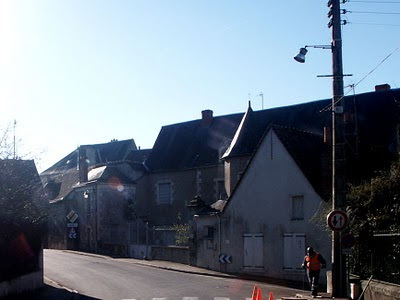 In Preuilly-sur-Claise, they had a fair centuries ago, since the 'saffron route' passed through the Touraine. With its passing, an imperfect history has been reborn today from the ashes. Twenty years ago, saffron producers from the Gâtinais [an area to the north east of Tours, between Orléans and Paris] imported, from Kashmir if you please, the bulbs which would come to cheer up the Touraine du Sud [the area south of Tours to Preuilly] with its welcoming soil. The soil only needs to be slightly damp and they say that three showers in the early autumn will produce the mauve coloured petals, the yellow stamins and the orange stigmae. Two or three years after planting bulbils will flower. So we are talking about a renaissance in the heart of a district with some thirty producers. They also come from neighbouring le Grand Pressigny, to swell an event that in good years and bad welcomes a thousand visitors. People come to buy the finest spice at a price they can afford. Depending on the stall rather than on the quality, the price ranges from 18-25 €. 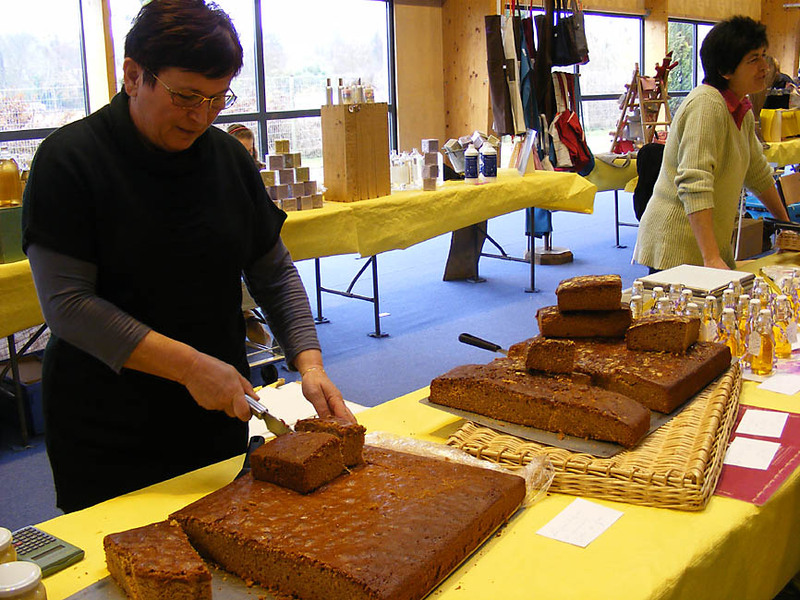 'We generally advise a price around €20' says Agnès Devijver, the President of the Saffron Producers Association in Touraine, created four years ago. We met the woman below on the right at our very first Foire au Safran. She is a beekeeper who makes the most excellent nougat and pain d'épices - lovely and moist and delicately spiced. Yesterday her sister, on the left, was helping her out on the stall. She is cutting a piece of pain d'épices au safran for me, but they also had nature and orange (which is more for Christmas, she explained). My post about pain d'épices can be read here. 'But if you go on the internet, it's often around 30 or even 40 €'. 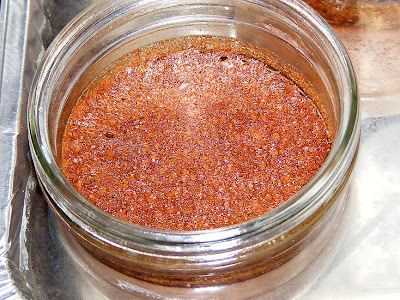 A gramme gives you enough to cook several dishes. 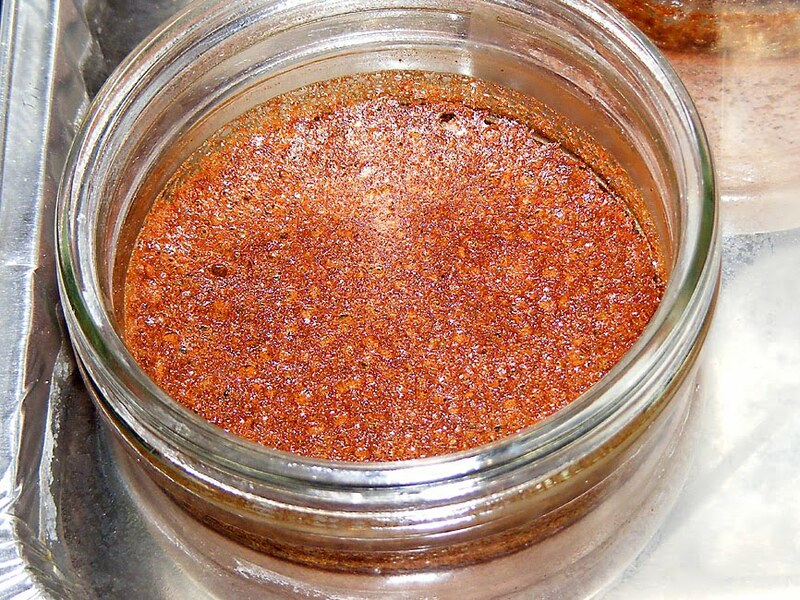 A tenth of your gramme of this precious spice is enough to flavour and enhance both savoury and sweet foods. Martine from le Restaurant de l'Image and their sous-chef de cuisine handing out saffron flavoured amuses bouches. They did the catering for the saffron themed lunch, as usual, but this year did it on site. 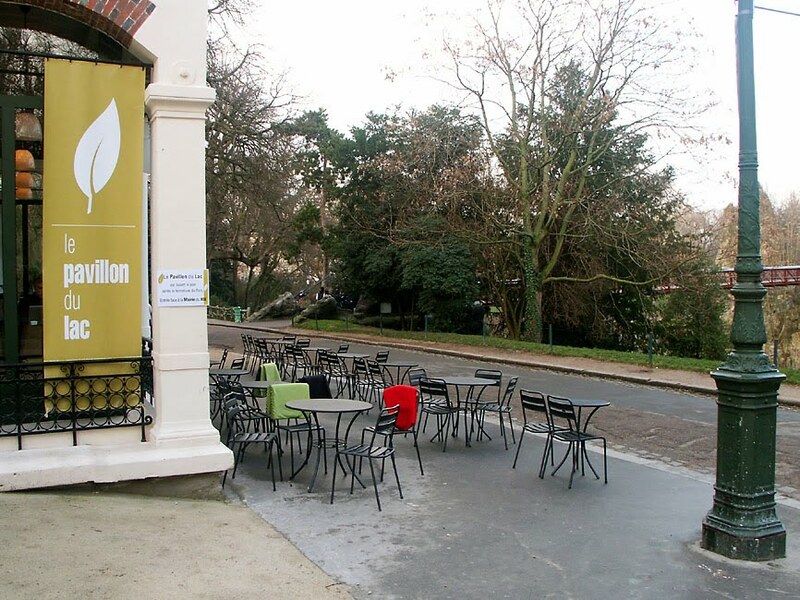 I spoke to Martine's sister-in-law, Sylvie, and she said it had advantages and disadvantages, the main one being that there was no kitchen on site, so everything was being ferried down from the restaurant a couple of blocks away. Just like those we can discover this weekend, on the stalls and with the producers. 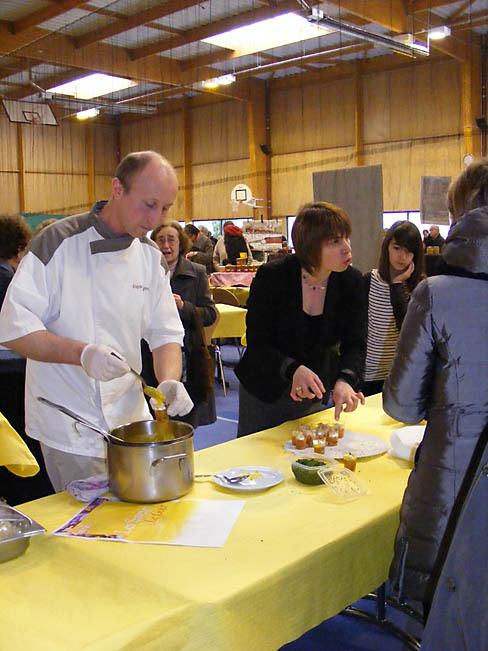 This year there is a stand demonstrating saffron based foods and a restauranteur offers a saffron themed meal. I bought two fourées au safran from these nice young men. 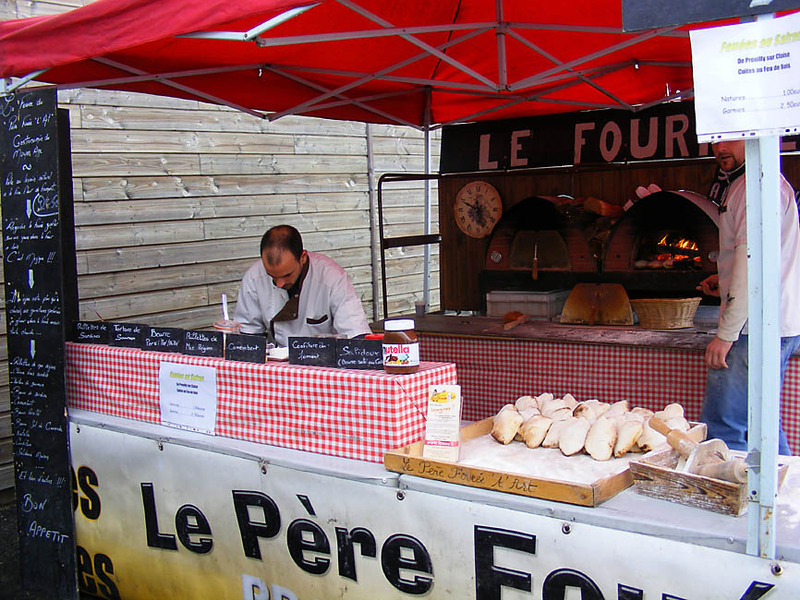 Fourées are like pita breads, and I had mine filled with sardine rillettes to take home for lunch. There was a bit of joshing about setting up a franchise in Australia, but we decided they would need a boat. The italicised text is my rather poor translation of the local newspaper article about the Foire au safran this year. It was written in that rather florid and disjointed style that journalists often adopt when writing about heritage and I find impossible to translate well into English. I hope I've been able to give you a 'flavour', anyway. 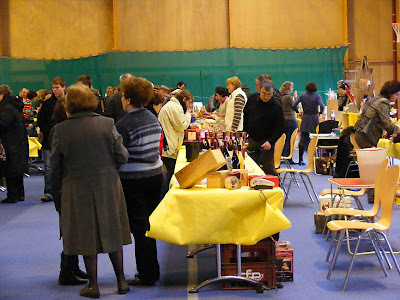 I was glad to see many of our neighbours at the fair, including our friendly lady orchard neighbours (who introduce me in exactly the same way, as their voisine du verger). They have seen Simon's work in the potager and approve. They also quite enjoy seeing themselves occasionally on the blog I think. You can see one of them peeking out from behind the sous-chef above. I also ran into Jean-Louis, who was one of the team who made our staircase. I was pleased to see him, as I haven't done so for a while, and as many of our local readers will know, he tragically lost his son a couple of months ago. I did my best to offer condolences, and he appreciated that, but it is very sad. Also on my 'chat list' was Monsieur Mériguet, who has taught us so much about saffron. He was unimpressed by my feeble excuses about why I haven't done any dyeing yet with the saffron flowers he provided though. He was hoping I would have something for the fair. Oh well - next year I guess. One of the things we really like about this part of the world are the rivers. Many of them are big, wide and slow flowing, and the rest are just slow flowing. Every single one is a lazy river. The Loire itself is a very shallow, wide river to cross, running across a plain, but in places along its valley the Vienne river runs deep. The Claise river doesn't run deep, nor is it wide, but it is our river and when we go to the river there is always something to see. If we are really lucky we will see a kingfisher dive in the river, but more often it's a coot paddling along the edges. All these rivers can sometimes lead to confusion, not a good thing when a bloke is supposed to know his way around. We have had the occasional discussion about the name of the river we are approaching, or what river a certain town is on. Because of this I have prepared myself a map. Except that those particularly perceptive amongst you will have noticed it isn't actually a proper map, but a schematic map in the tradition of Harry Beck. True to the spirit of Harry Beck, the geographical relationship of places isn't an issue, the importance lying simply in which order places occur. These aren't all of the tributories of the Loire River - in fact they aren't necessarily even the most important tributories. It is a fully personalised schematic showing the rivers (and the towns on them) that are important to us. 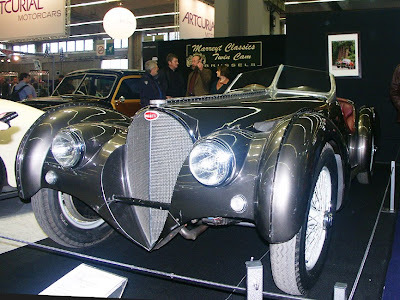 By far the most photogenic car at Retromobile was the Bugatti Type 57 Atlantic Spider. It is a triumph of the style of design that seeks to honour the materials and construction methods by allowing them to form the shapes and patterns of the object unadorned. 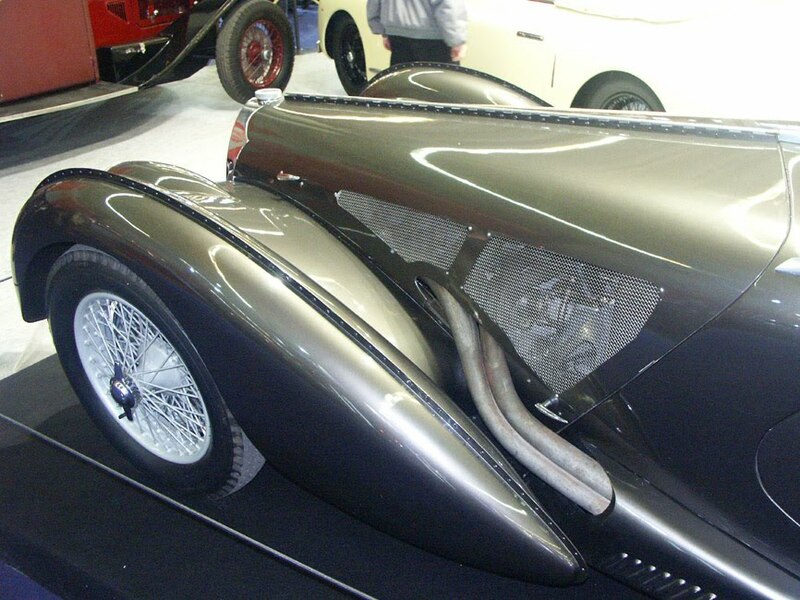 I'm always a sucker for welded and rivetted metal sculpture, and this is precisely what this vehicle is, designed by someone who had thought about every curve, angle and plane in three dimensions. 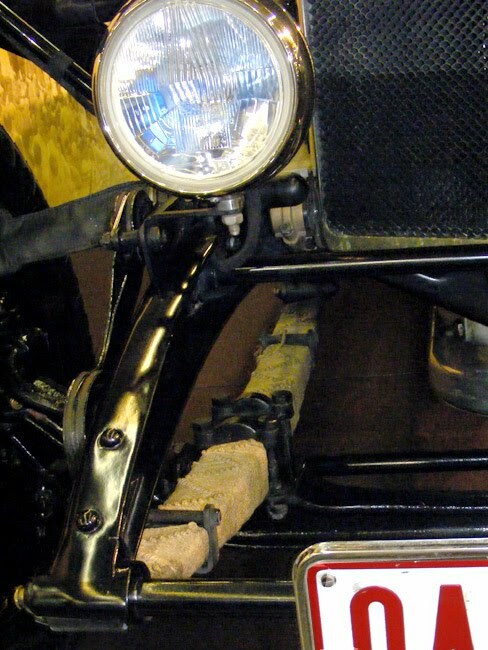 I have absolutely no interest in what its top speed is or how much noise it makes or even how much fun it is to drive. 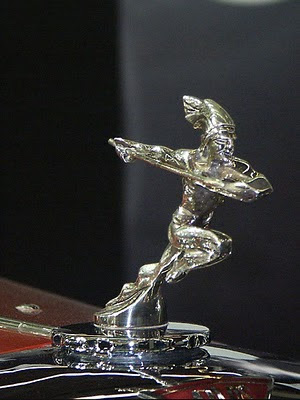 It is an objet de vertu. I love the way the exhaust pipes sweep out from under the bonnet and dive into a sheath tucked in behind the wheel arch. I love the simple stainless steel grill bonnet vents that allow you to see through to the engine. 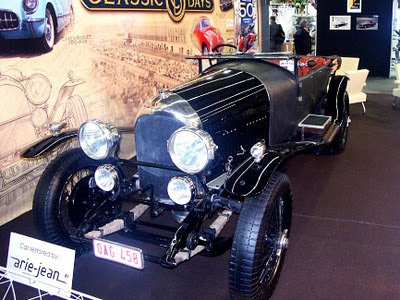 The body has been painted, but in silver grey metallic, so that your impression is of brushed stainless steel. There were other Bugattis at the show, but none of them had the visual impact that this one did. The difference between silver grey metallic and the battleship grey gloss on a standard L57 Atlantic is remarkable, for instance. This is a sort of replica - it is a proper L57 Atlantic which has been rebodied with a "Spider" body. 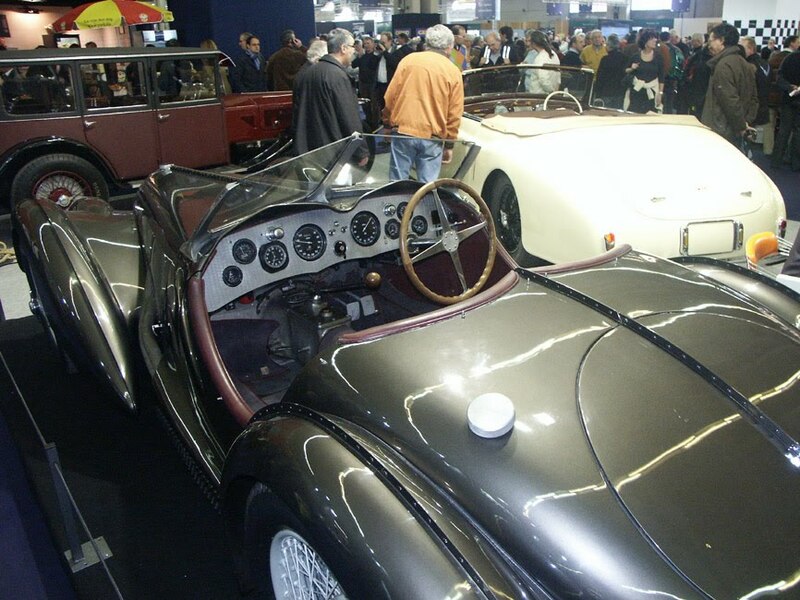 I can understand why you might want to do this - the last time an original L57 Spider Atlantic was on the market , it sold for $30 million USD. Once assumes this will be a little less expensive. [EDIT] You're too late, some lucky person has just bought this car. 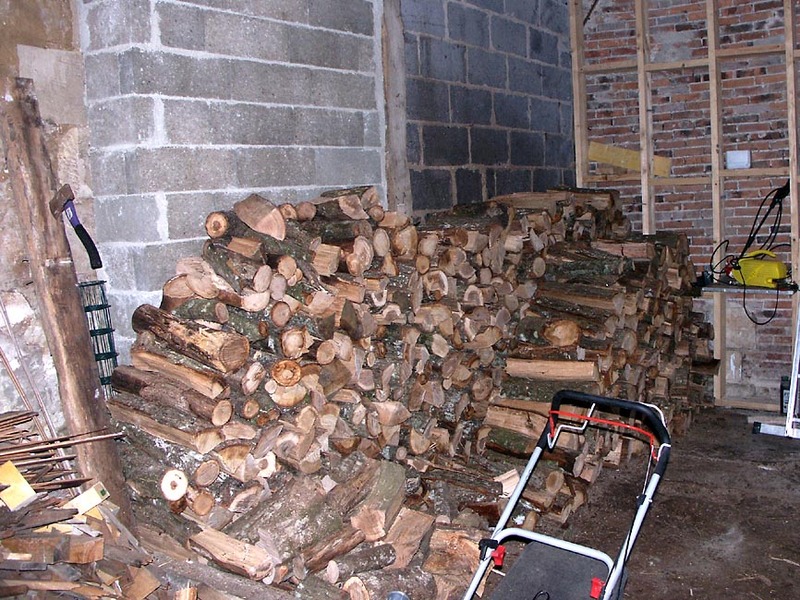 We are slowly getting some order into the garage and now find we have room for a proper French style woodpile. Previously we've been limited to ordering wood in batches of 1 or 2 stères (a stère is a cubic metre). 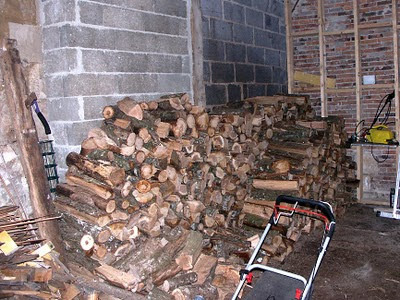 Since heating the house chews through a stère a fortnight, it gets a bit tedious having to order wood so frequently - both for us and for the woodman I suspect. This is what 4 fairly generous cubic metres of firewood looks like. With the new arrangement I confidently ordered 4 stères, and Edouard and his grandson duly delivered. It costs €42 a stère and is cut into 50cm lengths. Edouard even took back a few logs from the previous lot that were a bit big and recut them for us. This time it was all oak, and looks like the best quality firewood we've had so far. Last time we had a real mix, with oak, hornbeam mixed in with some birch and chestnut. Many woodmerchants advertise that their firewood is all aged oak, but actually hornbeam burns extremely well too. Most of the mixed broadleaf forests here are largely managed for the production of firewood, so it is local and sustainable. Four stères makes quite an impressive stack, although a real French woodshed would have at least twice as much. 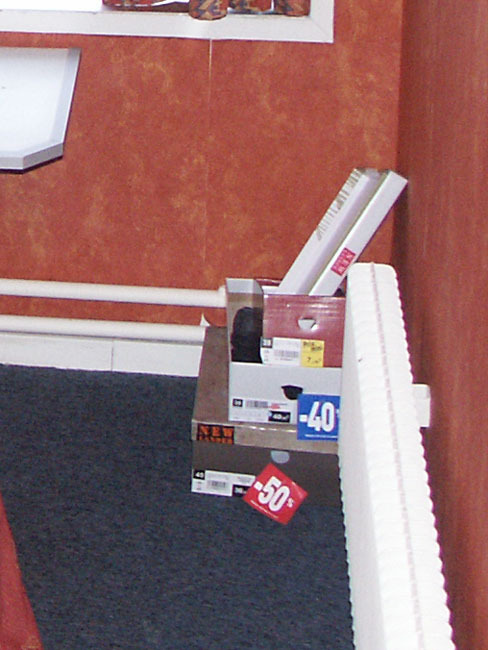 If we can keep everything neat and tidy, we should be able to as well, and not inconvenience Célestine too much. Old fashioned chocolate cream is a real family favourite in France. You can buy it in the supermarket in little individual plastic or glass pots, and my laitière (local dairy farmer who delivers) makes it on the farm and I buy it occasionally from her when she calls. Prior to adding the water to the bain-marie (water bath). 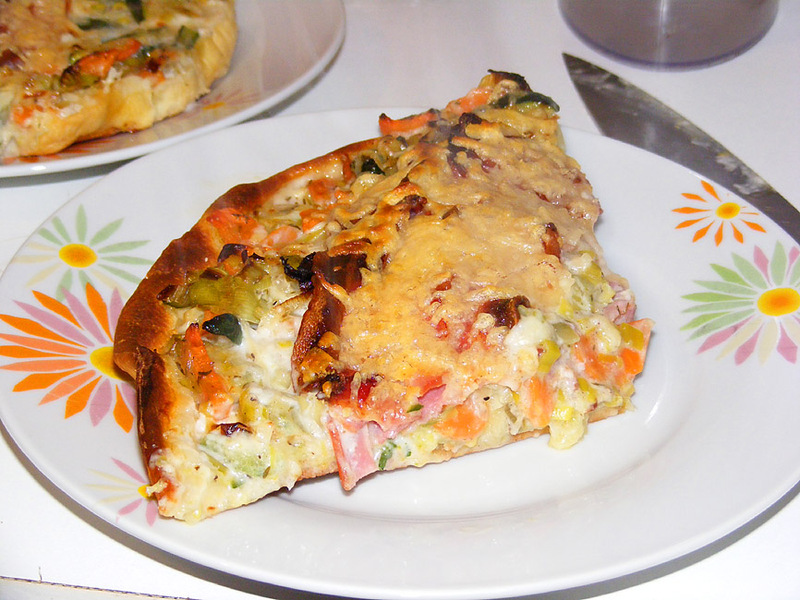 It's very easy to make though, and lately that's what I've been doing (and it's suitable for coeliacs). 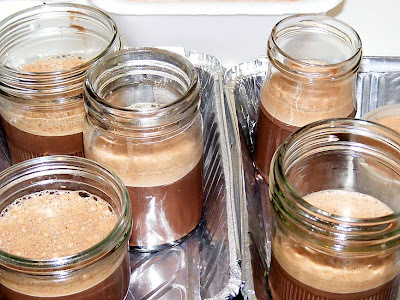 It's also an unpretentious and trouble free alternative to chocolate mousse. In the oven, gently steaming. This recipe serves 6. It takes about 15 minutes to prepare, 45 minutes to cook and 3 hours of refrigeration. Break up the chocolate and melt in the microwave with 100ml of the milk. Beat the egg yolks and sugar until creamy. 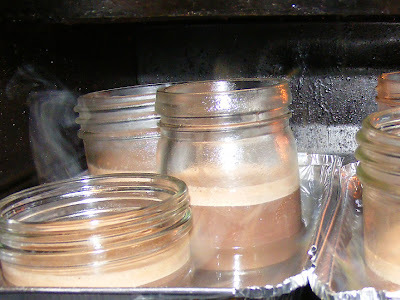 Divide into 6 heat proof glasses or ramekins. Put them in a bain-marie and cook in the oven for 30 minutes. Leave to get cold and put in the fridge for at least 3 hours before serving. Since I don't have 6 heat proof glasses or ramekins at my disposal at present, I use an assortment of jam jars. One advantage of this is that I can then just screw the lids on and pop the jars in the fridge. We eat them straight out of the jar with teaspoons. On Sunday I bought Célestine out of the garage for her first proper wash of the year. After Téléthon I had hosed her down underneath to wash away salt and grime, and given her a quick spray across the bodywork to remove anything that had been splashed up, but until the weather had fined up properly hadn't bothered washing her. In fact, it was such a nice day that afterwards I polished her and Susan and I went for a bit of a spin, calling in on Alex and Nicole. 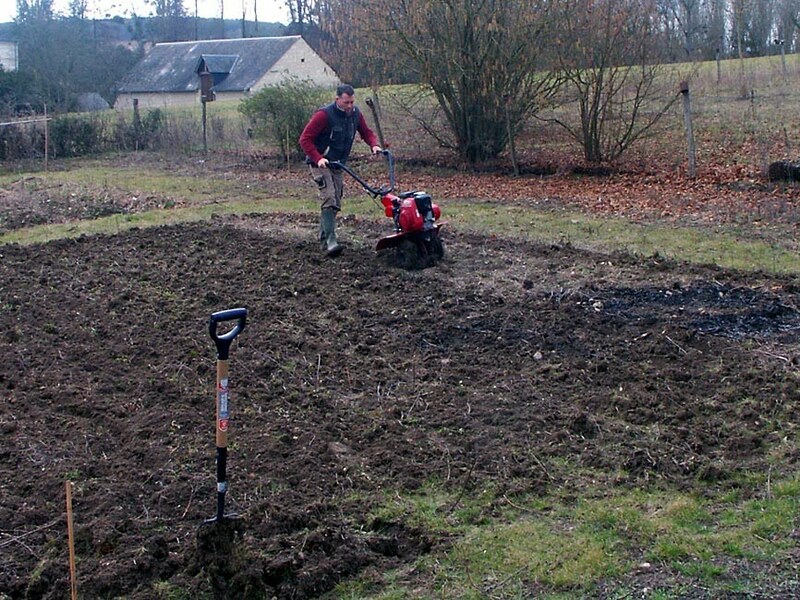 Alex was inspecting his new toy, a rotorvator, so we arranged for him to come over some time during the week and turn over some patches in the potager. This he did yesterday afternoon, taking less than an hour to do something I would have contrived to stretch out over three years. 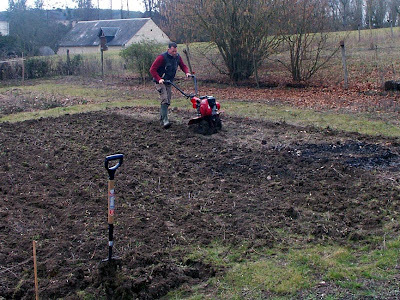 The next stage for the veggie garden is to plant broad beans and mange tout, then wait until it properly warms up. The patches we arent using this year, I will wait for the weeds to sprout, then cover with geotextile in the hope of killing them off before next year. 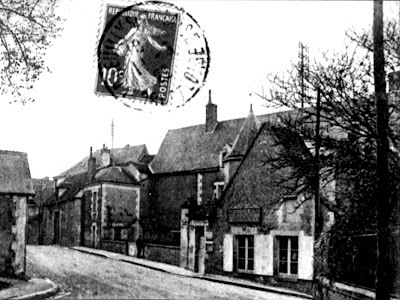 As is now usual for us, when we went to Paris at the beginning of the month we went by bus and train: bus from Preuilly to Tours, train from Tours to Paris. The bus cost us the princely sum of €1.70, the train €17 each. Ken asked last year how we manage to find such cheap train fares. Our secret is to book early - the tickets become available three months in advance, and as there are only a certain number of cheap seats on each train these tend to go early for the popular times. 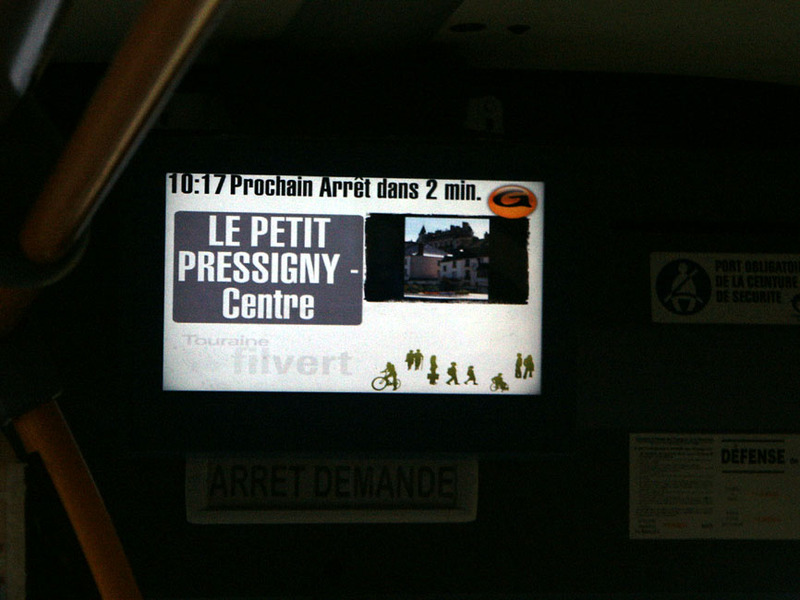 We prefer to catch the bus to Tours, and unfortunately, the bus coincides with the popular train times. If you have some flexibility getting to the station (or are prepared to hang around in Tours for a couple of hours) there are nearly always some €17 each way seats available, even for the next day. The trick until now has been finding them. 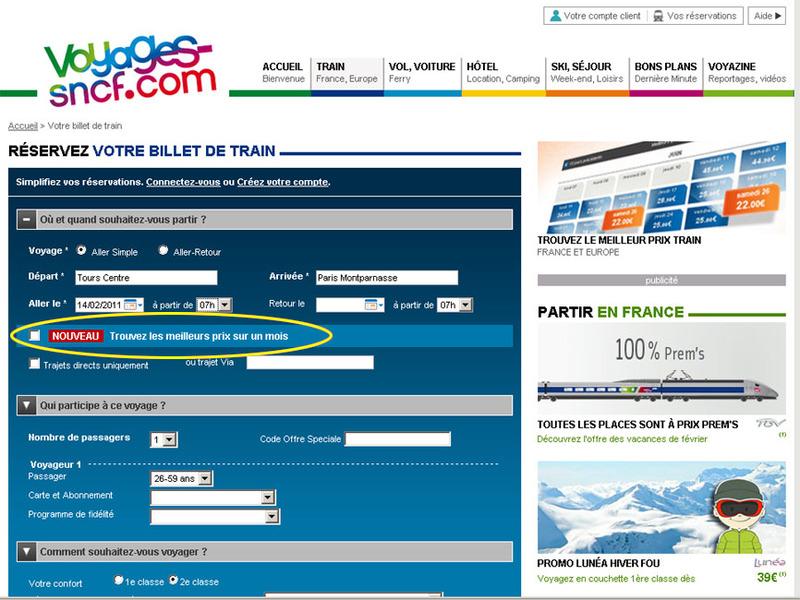 Recent changes to the SNCF Billets site has made finding them easier. You start by entering the Stations (or towns) you are travelling between. 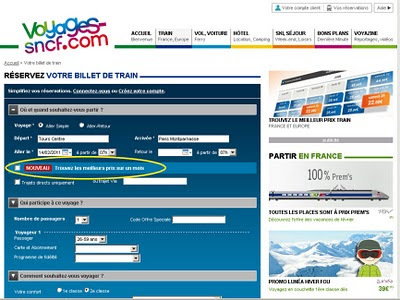 Then just put in the date you want to travel, and check the "Trouvez les meilleurs prix sur un mois" box and click the Rèservez button. On the screen that comes up choose the day you want to travel. 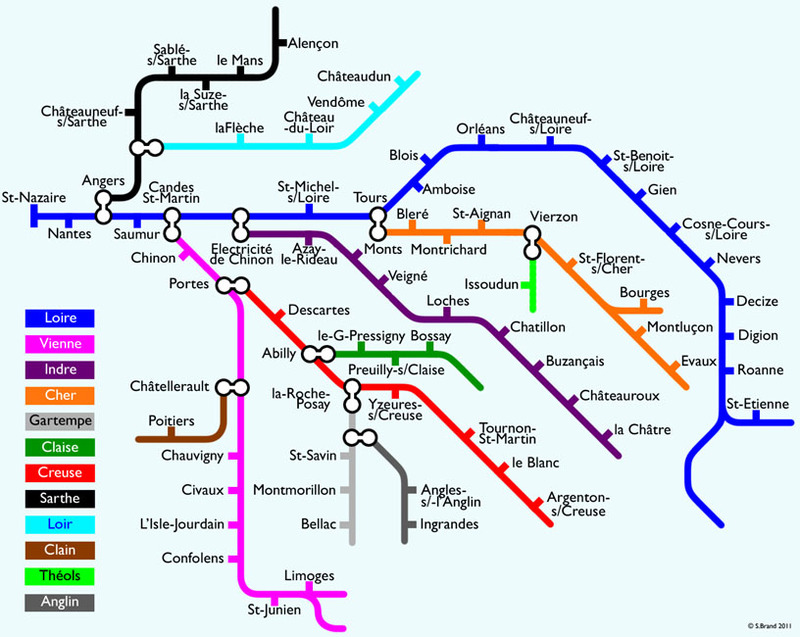 This will show you all the fares available for that date, then all you have to do is scroll down to find the cheap one. 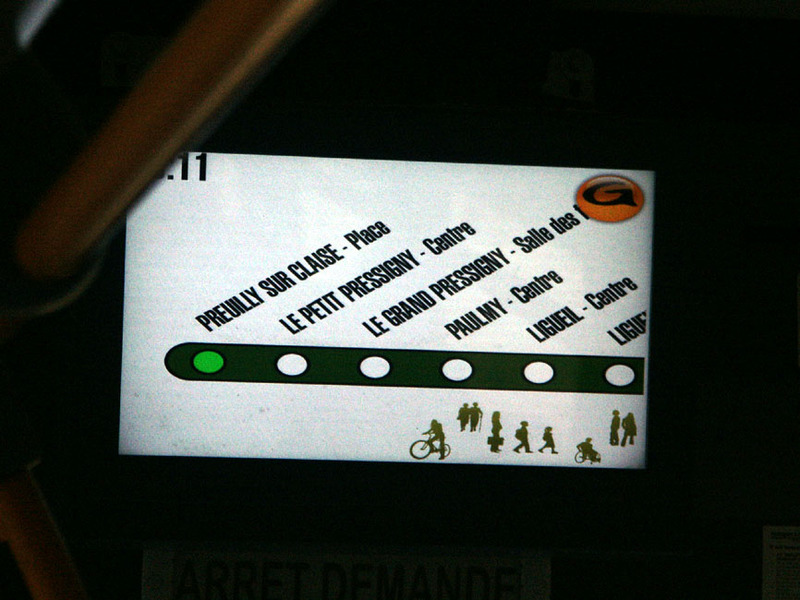 Usually for us it is the last train of the evening (which arrives in Paris at 11.00pm), but even a few days before you travel there are often tickets available on the midday train. 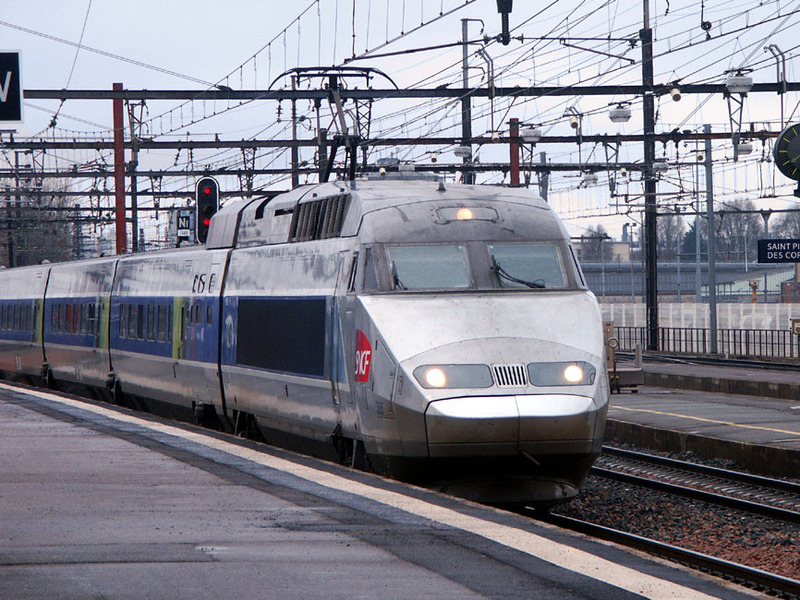 When travelling from Tours Central to Paris it is often cheaper to buy a ticket from St Pierre des Corps and just purchase a navette ticket (€1.20) between Tours and St P.d.C. on the day: when I was writing this the cheapest fares for tomorrow from Tours to Paris Montparnasse were €31.50 whilst from St Pierre des Corps the cheapest were €17.00. ... especially when the person concerned hasn't made the request yet. However, we will make an exception for this Alvis 4.3 Litre Short Chassis Vanden Plas Tourer of 1937. Yes, it's orange, usually a colour I don't go for much (it is, however, one of Susan's favorites). Period road test figures show a 0-60mph time of 11.3 seconds and a top speed of 103.45 mph. 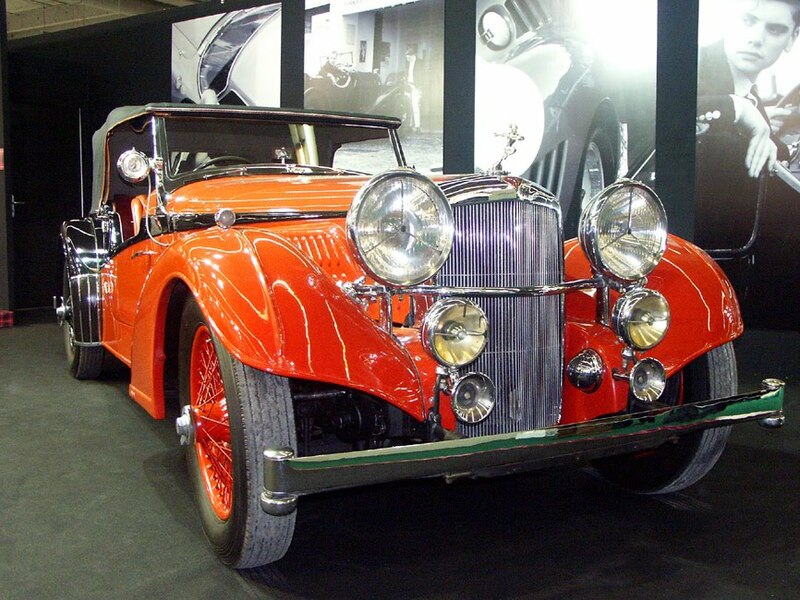 Most owners restricted the use of their Alvis to the road; this short chassis bucked that trend. Driven by George Hartwell and R.S Newton, DHP 233 competed in the 1938 Light Car Club Three Hour race for sportscars over the Campbell Circuit at Brooklands. 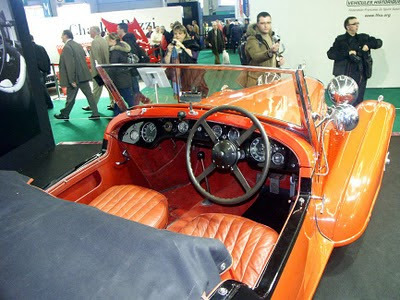 Intriguingly, DXP 233 also featured in a contemporary Alvis Ltd advertisement indicating the car won first prize in the RAC Rally, Blackpool in the Coachwork category. The information is taken from the Fiskins website. The first post office in Preuilly sur Claise was in what is now a fairly anonymous building on the rue Notre Dame. For quite a long time I looked at the old photo of the building and couldn't work out where it was - it didn't look at all familiar. I am not sure when I realised that it was a building I passed just about every time I drove the car, and had walked past dozens - if not hundreds - of times. One of the interesting things about this building is that although the post office moved from here many years ago it still has a post box, just down the laneway to the right. 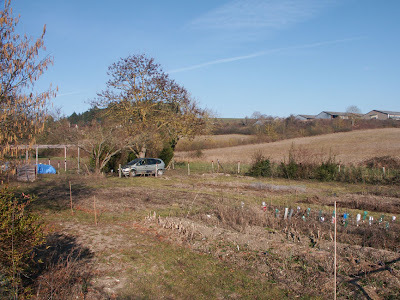 Yesterday we went to the potager to start preparing it for the coming year. I mowed around where I want the vegetable beds to be and hacked out many of last year's weeds. 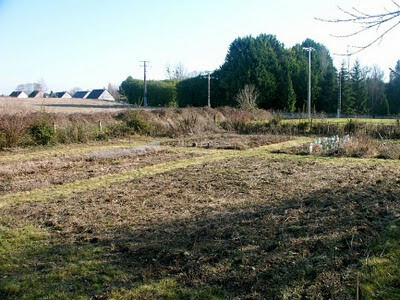 This year I am having three largeish beds rotovatored, with 2 metre wide paths between them. One bed (where last year we had onion and garlic) I am leaving fallow. When we first bought the garden the potager was completely tilled, which was far too much space for us to plant, and even more far too much space to keep weed free. I will be planting less variety of vegetables this year: potatos, onions, garlic, a couple of varieties of beans, tomatoes, peppers, chillis, aubergine and sweetcorn. I might plant a couple of courgettes and a melon, but the melon seedlings always seem to arrive in the shop too late to produce fruit. Carrots and beetroots dont appear to like our soil (either that or we have never prepared it properly) and leaf vegetables need too much water. The strawberries will be left to fend for themselves as they were a dead loss last year: even though we had about 60 gazillion plants we had one punnet of fruit. Likewise the raspberries (which all appear to have died), and the currants, which appear to resent having to produce fruit. 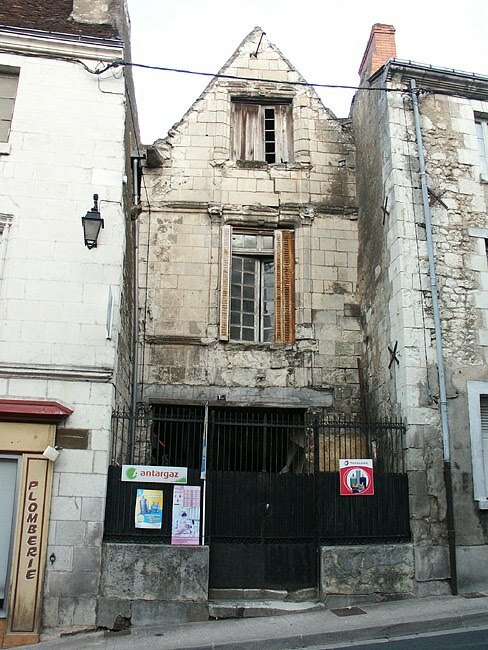 This rather sorry looking tuffeau (soft limestone) building on rue Chaumont-Patin in Preuilly dates from the 15th to the 18th century. Up until the Revolution, middle class and aristocratic boys came here to learn Greek, Latin and mathematics and it was the best college in the district. The college was run by a lay person, who lived not far away. In contrast, the convent lower down, was supervised by the Benedictines from the Abbaye Saint-Pierre who taught in both establishments. The monks would also have been hoping to encourage a few religious vocations amongst the students. 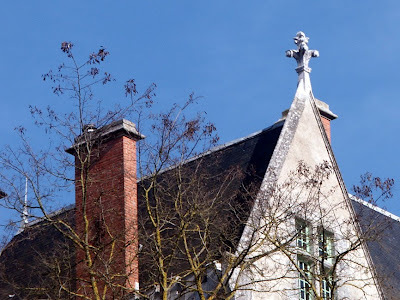 Although now tatty on the outside, and blackened by smoke, the building apparently has a magnificent attic, constructed with such care with its beautiful carpentry and well finished roof that it points to this being the dormitory. For all its beauty it would certainly have been very hot in summer and very cold in winter. 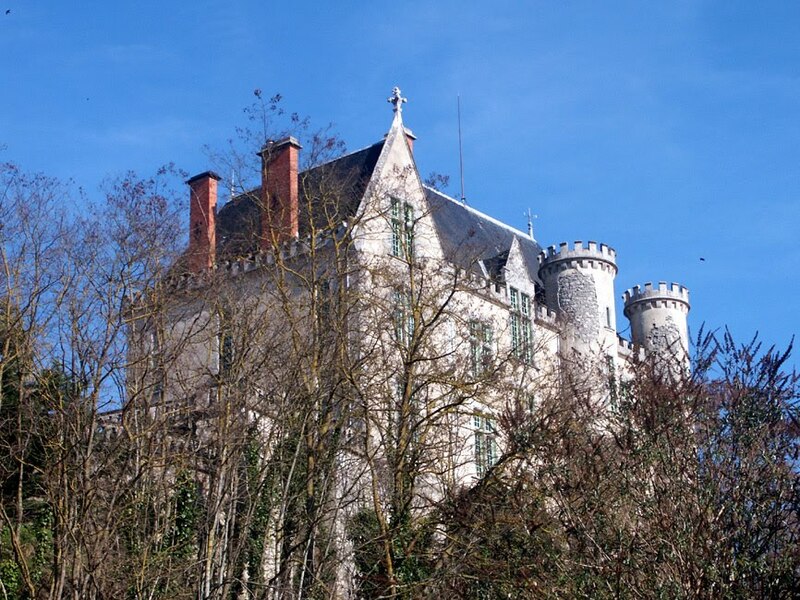 There is an exit into rue des Douves and a staircase tower that gives access to the dormitory. The Revolution brought an abrupt halt to the scholarly activities, because the abbey was forced to close and the college therefore lost its teaching staff. This was openly regretted by the townspeople. From then on the building's history is very chequered. In the 1920s, downstairs was the locksmith Ribotton's workshop. The forge was directly below the living quarters. Ribotton's oldest daughter Liliane married General Ailleret, who pressed the button on the first French atomic bomb, tested at Reggane in the Sahara. In the 50s the ground floor was the plumbing and locksmith workshop of Monsieur Luneteau (known as Bouboule due to his rotund shape). 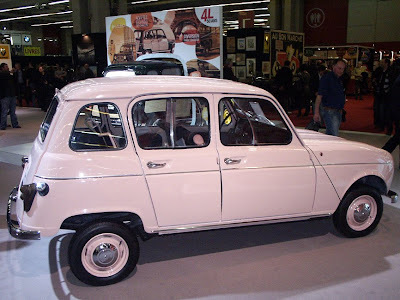 Later an electrician called Monsieur Perrin used it as his workshop. At the moment it is being used as storage space. The past few days have been lovely, with properly warm sunshine arriving by lunchtime even when the day starts foggy or frosty. This means some of the spring emerging insects are making an early move. Some of them will benefit from being able to forage a bit to tide them over until the reliably warm weather. 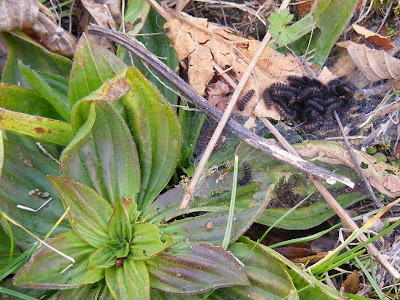 Mostly these are species that overwinter as adults and can simply tuck themselves away in a protected spot for a few more weeks of dormancy when the chill returns. 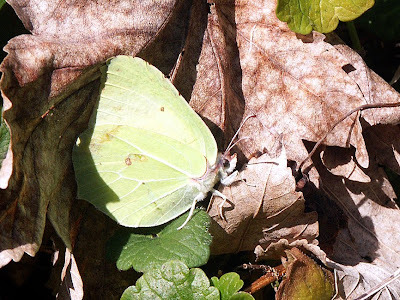 We've seen Brimstone Gonepteryx rhamni (le Citron) butterflies out and about. They hunker down hidden in thick ivy or bramble to survive the winter, but can often be seen flying as early as February. They 'hatch' in summer and can live as long as 11 months, hibernating through the winter and emerging to start the new generation the following spring. Here, with our chalky soil, the caterpillars eat Common Buckthorn Rhamnus cathartica (or le Nerprun purgatif in French). A Brimstone soaking up some rays. Also out and about are Marmalade Hoverflies Episyrphus balteatus (les syrphes ceinturés). 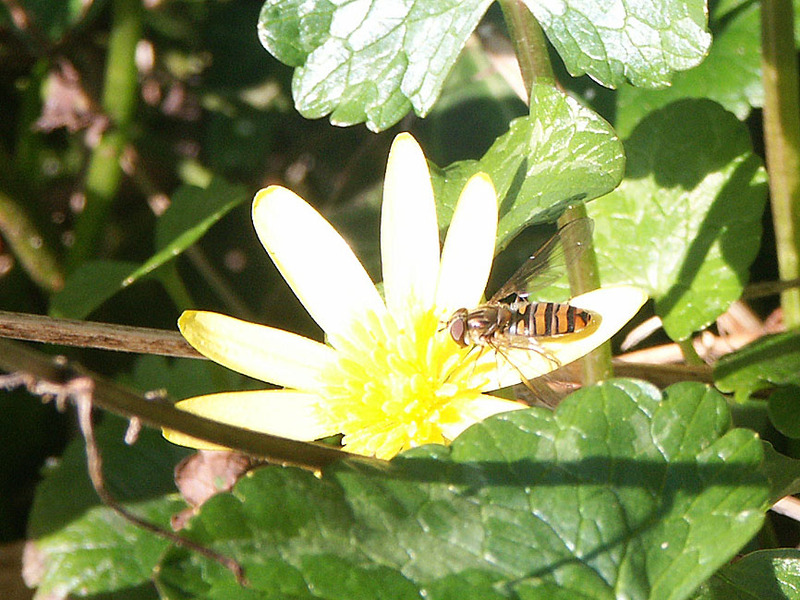 This extremely common hoverfly can be seen in any month, although if it is cold its ability to fly is compromised. It can overwinter either as an adult or as a larva. I think this one has spent the winter as a larva and is newly 'hatched', judging by how dark its colouration was (darker than it appears in the photo). Many hoverflies are affected by the temperature during pupation in this way, being dark in cold weather and brightly coloured if they've developed in the warm summer temperatures. Other insects becoming very active with this early warm spell are the Violet Carpenter Bees (les Abeilles charpentières) and European Honey Bees Apis mellifera (les Abeilles européenne à miel). On the last day of February last year we we visited by a nasty storm called Xynthia. She caused 51 deaths in France, flooding in the Vendée and Charente-Maritime, and recorded a highest wind speed of 241km/h (150mph). In Preuilly it was quite scary and some damage was caused, but no-one died and no buildings were destroyed. Many people lost power for quite a long time, but the only damage we had was losing one (1!!) slate, and having no internet for a couple of days. The Chateau roof lost its stone finial , which caused quite a bit of damage as it fell. Since then the chateau has been scaffolded twice, the first time to repair the damage to the roof covering. 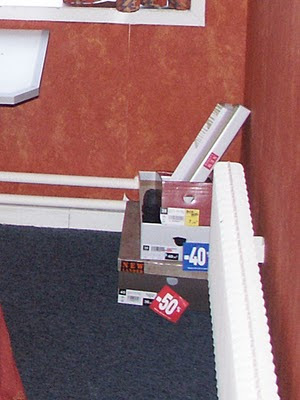 Then the scaffold disappeared, only to return about 2 months later. That is where the situation was at until quite recently: on Sunday we went for a walk and noticed that the chateau is now restored to its full glory and the scaffolding gone. 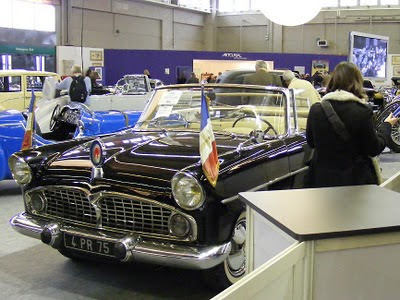 Last Friday Susan and I were in Paris to go to Retromobile. (See how casually I say that? Makes us look windswept and interesting...). There were, unsurprisingly, lots of cars to look at and covet: an exhibition and sale of ex-presidental cars and a lot more besides (if you start clicking on the photos on that link , any car lover will find that they lose a week of their life), plenty of legendary names, and some iconic cars having birthdays. 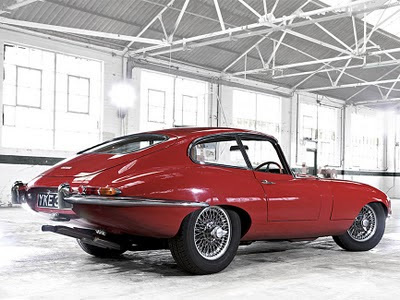 The cars having birthdays were the Renault 4L and the E-Type Jaguar, both first built in 1961. One is British and a sports coupe, the other is French and an everyday driver. Both are much loved and desired by certain parts of the population, but only one is truly affordable. Over the next couple of weeks we will put up some of the other cars we saw and covet and/or appreciate on aesthetic grounds. This year we didn't buy anything, whereas last year I bought some headlight bulbs. The last of the big spenders, I am! What Happens in and around Preuilly in February?